I am so excited to have found this forum. 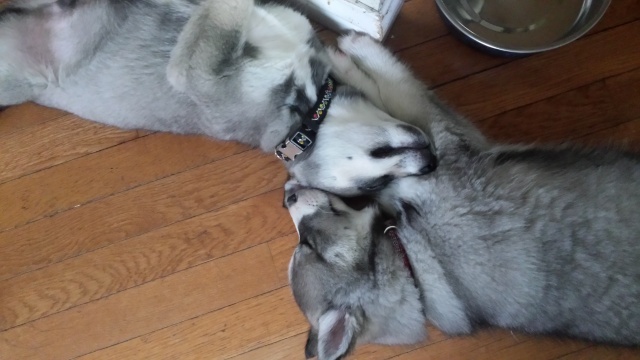 I am bringing my 2 huskies home tomorrow they are 8 weeks old. I was wondering if it would be alright to keep them together in the same crate. They are both boys and from the same liter. TIA!! In general, this will be a bad idea. One of the major points to a crate is calming, and, well, there'll be nothing calm about them both in one crate. It might be a temporary solution at first, but eventually, you will need to separate them (feeding, bones, grooming, etc. ) and you will need them to be comfortable apart from one another. It is already going to be an extra challenge for you with littermates as they tend to be very bonded to one another. You are going to need to separate them when they are older and bigger and if you start them early, you are setting yourself for success later on. You want to train them now for the dogs you want them to be in a year, two years, and so on. They will be together PLENTY. And remember, if they are in the same room but crated separately they can still smell one another. They know they are not apart even if they can't see or touch one another. Take full advantage of their sponge-like learning phase when you get them and teach them the appropriate boundaries and limitations right off the bat. Day 1 is an enormous precedent setting time and since they can't be crated together forever it will be best to not try that now. Can I ask another question? The breeders kennel is outside so they all have been outside ever since being born. Do you think it would be alright if I gave them a bath right off or should I wait? Nothing wrong with a bath. Just make it a positive, fun experience and you should be fine. It is probably best to do it individually as opposed to both at the same time. Great!!! Thank you again. As soon as I can get some pictures i'll get them posted. if you get a crate with 2 doors and a divider you could keep them in the same crate but they are separated, might be a short term solution. also read up on raising litter mates, you need to work very hard to make you in charge and not have them bond to strongly. Good idea... I did get a crate with 2 doors... I never thought of seperating them like that.. I'll look for the "raising litter mates" topic. Good point Jennifer. Physical separation is the key. Wow two pups! That's going to be some work, but I'm sure a very rewarding experience. Nice to meet you, can't wait to hear more about this duo! Here's a pic of my new boys... One of these days I'll get a picture of them both looking at the camera. For now they are so busy I can't get one together that isn't blury. Good luck with that I've been trying for 6 months to get a shot with Ami and Archer both facing the camera. Subject: Re: 2 Puppys 1 Crate?